E-Mail Questions at: leonelnnicholson@ukdealers.com . 2001 Dodge Viper in Great condition, garage kept and meticulously maintained it's entire life. The car runs great, is incredibly clean inside and has well tuned performance upgrades. 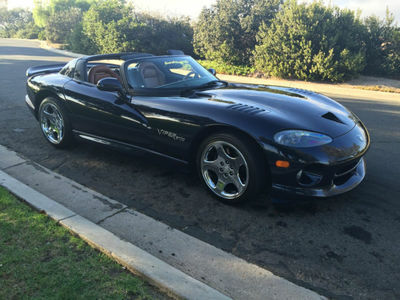 It has been owned by Viper club members and all work has been performed by Viper technicians. Upgrades include headers, borla exhuast, intake, K&N filter, short shifter. The car is upwards of 550hp and sounds very "throaty" exhaust wise. If you are seriously interested I can send videos of the car running to get a better handle on everything about the car. This vehicle is in great shape and has very few scuffs cosmetically and I'd give it a 9 of 10. The paint is in perfect condition and does not show any signs of age or scratches on the body. Mechanically, I'd give it a 10 of 10 as it has always been regularly serviced and has zero issues. The car is in perfect mechanical shape with zero issues and a clean past.